People with new construction homes and remodeling projects alike often walk into our hardwood flooring store with their mind set on getting hardwood floors for their home. Most of those people want hardwood flooring because they have fallen in love with its timeless beauty. They also know that hardwood floors will increase the value of their home. While it's true that hardwood has a classic look that never goes out of style, hardwood flooring isn't best in every situation. How do you know if hardwood flooring is right for you? Compare the pros and cons of hardwood flooring before you shop. A neutral backdrop for your personal style. Modern or country, classic or contemporary - you can find a hardwood floor that matches any interior decor. 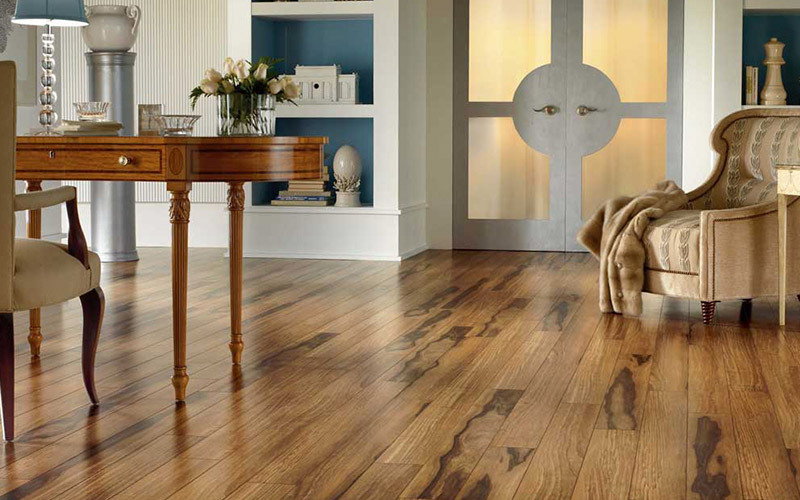 Plank width, wood species and stain colors allow homeowners to select a wood floor that complements any room. In fact, hardwood floors are often neutral enough that they can be used throughout the entire house with a different appearance in each room depending on your furnishings and decorations. Long-lasting and easy to clean. With proper maintenance, hardwood is a floor that can last for decades. And proper hardwood floor maintenance is about as simple as it gets - wipe up spills quickly and sweep regularly. It is important to consider foot traffic when you select your hardwood floor, however, as some finishes or wood species are less durable than others and can easily be dented or scratched. Allergy friendly. Hard surface floors are the best option for people with allergies. Hardwood floors won't trap dust, mold or mildew - the most common irritants for indoor allergies. Often people who have had carpet for years notice an immediate difference in how they feel once a hardwood floor is installed. Learn more about good floors for allergies. Timeless value. Hardwood flooring adds value to your home both now and long into the future. Very vulnerable to any amount of moisture. Water is a wood floor's worst enemy. Even just a humid environment can warp or damage a hardwood floor over time. And if you have a leaky pipe that lets water beneath the wood and into the subfloor - you'll have to replace the entire floor. Cannot be installed on every subfloor. Hardwood flooring needs an even subfloor for proper installation. Without that, the boards can warp and crack or won't lay flat giving you an uneven floor. It's loud. There's no getting around it, steps on a hardwood floor are loud. Sounds also echo more in a room with a hardwood floor, especially if it's a room with high ceilings. You can alleviate the sound issue with area rugs, but a wood floor does not have the sound insulating qualities of carpet. It's expensive. Hardwood flooring is often the most expensive flooring option available. If you spread that cost over the lifespan of the hardwood floor, you'll discover that it's one of the best values in flooring. However, you still have to spend the money upfront and if you're shopping on a budget - hardwood floors may not be for you. After taking a second look at hardwood flooring, you may realize that it's not the best fit for your home or budget. You can still have the look and feel of hardwood with new floor products on the market today. Luxury vinyl and porcelain tile are excellent alternatives to hardwood flooring - and many people can't tell the difference when they walk into the room. Learn more about types of hardwood flooring available at Indianapolis flooring store, Kermans. Stop by our Indianapolis flooring store to learn more about hardwood floors - or their look alike alternatives! Our design consultants will help you determine which floor is best for your home, lifestyle and budget.